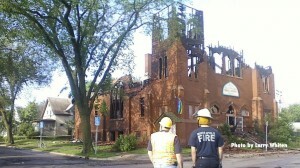 When the Walker Community Church burned on Memorial Day, Minneapolis lost more than an historic building. It also lost a center that housed may community action groups who are now trying to regroup. 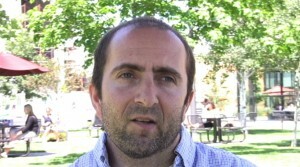 Brad Sigal is a member of MIRAC, Minnesota Immigrant Rights Action Committee, which was one of three permanent tenants in the church, the others being Welfare Rights Committee and Communities United Against Police Brutality. MIRAC did not have insurance on the office contents. Help is on the way, and despite the fire MIRAC is making progress on helping immigrants. Sigal recounted some of the long social action history of the century old buiding. In the 1980s it was a refuge for immigrants under attack as a result of the Sensenbrenner Bill. The church even provided living space. MIRAC continues its work meeting in a library and a bookstore until permanent arrangements can be made. The Headwaters Foundation has created a web site to raise funds for the three organizations. Previous story about the botched investigation of the fire’s cause.